COLUMBUS, Ohio (CNS) — As society has placed the dignity of human life under constant attack, there has never been a greater need for the Catholic approach to health care in response to the needs of the sick, Cardinal Raymond L. Burke told participants in a medical ethics conference in Columbus. 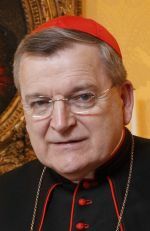 “In a totally secularized society, there is more than ever a hunger for the witness to the meaning of human life and human suffering which Catholic health care gives,” said Cardinal Burke, who lives in Rome, where he serves as patron of the Knights of Malta. A former archbishop of St. Louis, the cardinal is a church law expert and former prefect of the Vatican’s highest court, the Apostolic Signatura. Cardinal Burke spoke on “The Economy of Life and the Catholic Identity of Catholic Hospitals in an Age of Secularization” at the Feb. 7 conference held at Ohio State University’s College of Medicine. It was organized independently of the college by Dr. Kimberly Klapchar, a resident physician in Columbus, and Giovanni Battista Bellomo, a law student at Bocconi University in Milan, who is a friend of hers. Catholic health care that is faithful to the church’s teaching has seven key elements, Cardinal Burke said. The first is “a sound and thorough understanding of what it means to be Christian and of the importance of providing health care in accord with the teaching, worship and governance of the Catholic Church,” he said. “What distinct care of the sick does an institution of Catholic health care offer if its life is not rooted deeply in a knowledge and love of the church and of her teaching?” he asked. The second element is “knowledge and commitment to a distinct form of health care, namely the care of the sick and the dying in the church, as an integral part of the church’s mission under the direction of the diocesan bishop and ultimately the Roman pontiff,” he said. “A Catholic health care institution cannot see itself as simply part of what is called the general health care delivery system, but must know that it is participating in Christ’s care for and healing of the sick. “The third element is the personal commitment of the administration and staff of the Catholic health care institution to the church’s teaching, to carrying out the care of the sick and dying after the mind of Christ alive for us in the church,” he continued. That commitment “cannot be simply adherence to company policy, but rather a knowing and willing adherence to God’s law providing for the true good of man,” Cardinal Burke said. “The fourth element is a Catholic understanding of man which inspires the care of the whole person,” he said. “Catholic health care can never view the sick and the dying from the impoverished perspective of biology or psychology alone, but must see the physical and emotional difficulties of the person within the context of his moral and spiritual life,” he explained. He did not give a specific example of such conditions, but the proposed U.S. Health and Human Services Department mandate which would force Catholic health care institutions, as a condition of receiving federal aid, to pay for things they consider immoral would fit the definition. The cardinal said the seventh and final element in faithful Catholic health care “must be the discipline of the desire for credibility or prestige which would lead the Catholic institution into relationships with large health care institutions by way of mergers, partnerships, or joint ventures.